I'll use this place to share my experience with my New Tohatsu racing engine. The information you will find here is not sanctioned by the APBA, Tohatsu America, Bass Machines, or anybody else for that matter. Some of the information may be incorrect. So please check my statements with the proper sources before giving them any kind of consideration. This is me, Jeff Yungen in race gear. 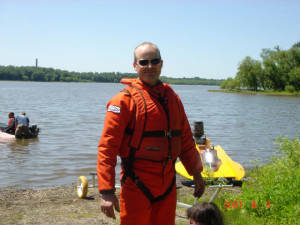 Kevlar cut resistant sleeves and pants and a racing floatation device. Looking back at this past season, I'd have to say this has been the best racing season of my life. I didn't win any races, BUT, I sure had a great time! And THAT'S what it's all about! Myself with Mike Ross lending a hand. 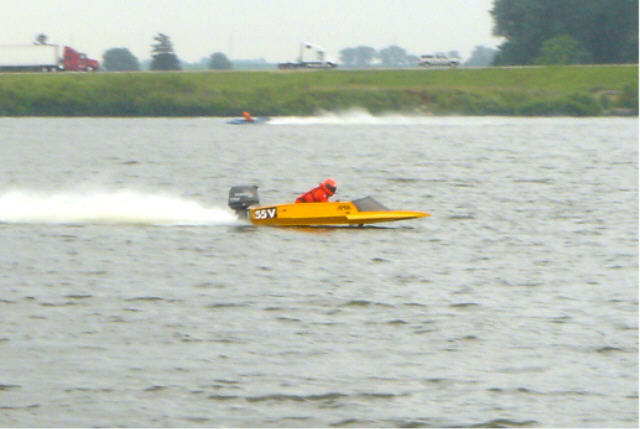 I repainted my hydro and finally got myself to a race in DePue, IL. I did quite well considering I didn't have any testing time prior to the race. I love racing at DePue! 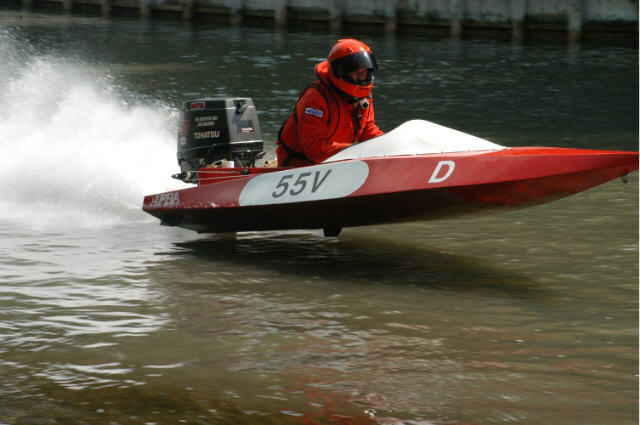 It's a great race site, and a very historic site, deeply rooted in powerboat racing. Racing at beautiful Lake Sule. I raced in Rochelle weeks after DePue. I was caught off-gaurd a couple times at the starts of the races, my bad! I needed to concentrate more during the starts. To make matters worse, I entered a turn completely wrong and crashed badly. I went to the hospital with some badly hurt ribs, but I was OK. My boat sustained some damage to the right cockpit side. I'm thankful for the great racing family we have in region 7. Lots of nice folks worked to dry out my motor and put my equipment away for me. created at the Rochelle event. Click the screenshot to view the clip. Top O' Michigan Marathon Nationals. 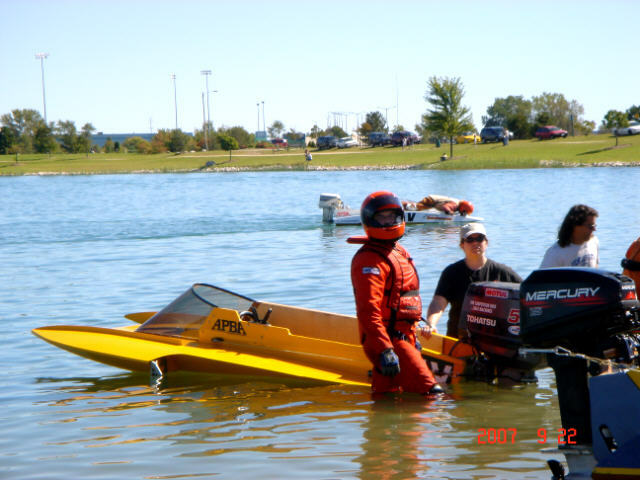 In August, I was able to compete in the Top O' Michigan Marathon Nationals in Indian River, Michigan. It was a completely new experience for me. What a great race! 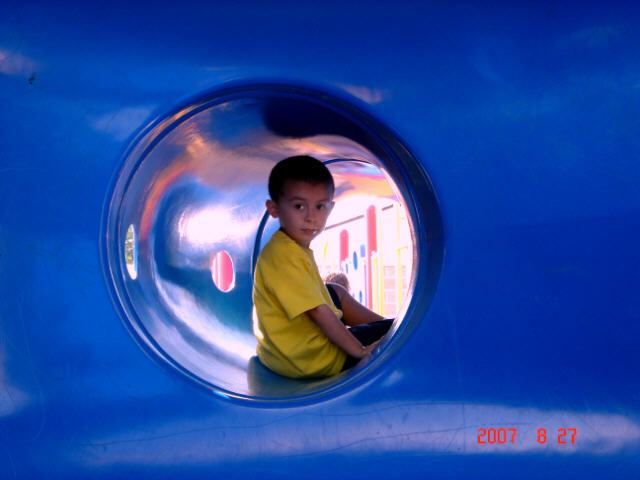 THIS was the most exciting thing I'd ever done! I acheived my goal of just finishing this marathon. I plan to race at this event again in '08. I strongly recommend this event to all racers! This is a race you will never forget! Myself with Stacy Griffin lending a needed hand. I had planned on ending my season after Top O'. But my good friend Kip Trump talked me into one more race. I'm glad he did. I had a great time racing in Pleasant Prairie. What a great race site! I'll be sure to race there next year. in the class "D" stock hydroplane class. I want to thank my loving family. None of my dreams could have come true this season without the love and support of my Wife and Children. I always try my best to make my racing adventures enjoyable for the whole family. But dispite my best efforts, I know there are times that are less than enjoyable for them. My family stuck by my side to support me and my dreams. Through the cold, rainy race days. The long, all night drives. And the extra tight budget weeks, because we were saving for a race trip. My family has always been there for me. Thank you so much, Mary, Jeff jr., Lani, and Shilo. I love you all with everything I have! 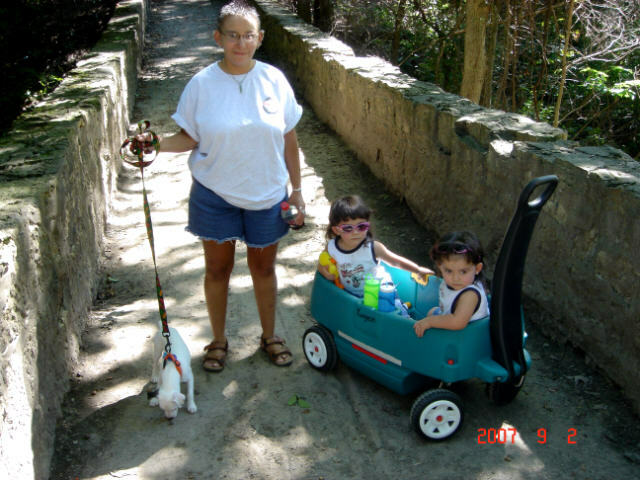 My wife Mary, daughters Lani and Shilo, and our dog Joey. 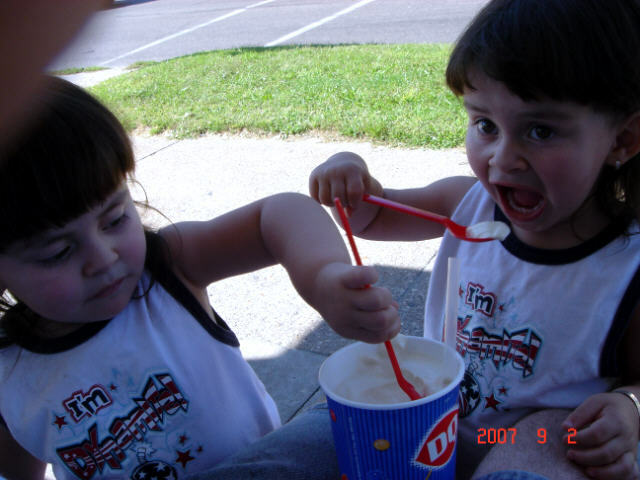 Lani and Shilo enjoying some Dairy Queen. I also want to take a moment to thank all the other nice folks who helped me out this past season. There were too many people to mention each and every one. 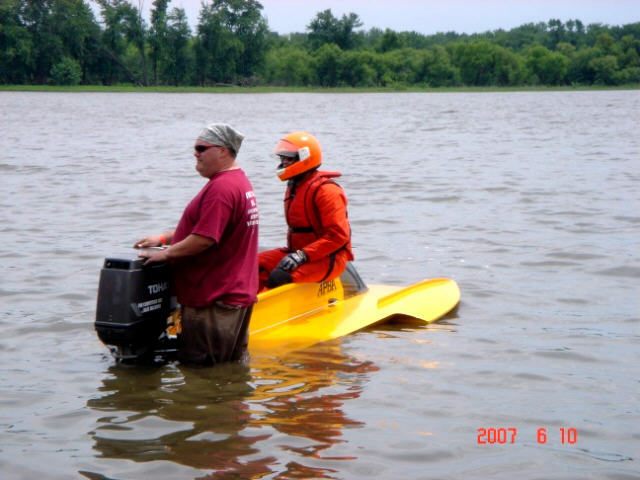 I had technical advice help with my new Bass/Tohatsu engine. Pointers on setting up my boats. Wisdom shared with me about race courses and stratagies. And a lot of helpful hands with starting and lifting my "big D" rigs. All the favors have not gone forgotten. I will always do my best to treat others the way I have been treated this past season. websites that might be helpful to you. Be sure to come back again from time to time and check for updates. I'll try to post a notification at Hydroracer.net when I have any significant news to report.